Opposition to Hitler and the Nazi state came from several areas. Political opponents continued to oppose Hitler’s policies. Many people, such as church leaders, had moral objections to Nazi policy. There was opposition from the army, partly due to the meddling in its affairs and later on due to the heavy losses suffered. Young people sometimes rebelled against the state, either in dislike of the youth movements, or as a freedom of expression. Minority groups suffered at the hands of the Nazi’s. This led to resentment and opposition. Unions often opposed the Nazi party This was partly due to political beliefs, partly due to the impact of policy on workers. We have detailed articles about Opposition to the Nazi’s on our sister site. Content includes biographies of well known opponents such as Martin Niemoller and Helmut von Moltke. There are articles on church opposition to the Nazi regime such as that from the Confessing Church or Catholic Church. It includes Sophie Scholl and the events leading to her execution by the Nazi’s. Opposition from the army includes Ludwig Beck and Claus von Stauffenberg. von Stauffenberg, along with Rommel, was involved in the famous July Bomb Plot. Why wasn’t there more opposition to Hitler? Many Germans lived in fear of the SS who could destroy peoples lives. As a result they were afraid to speak out. This fear of the SS along with censorship also prevented opposition from becoming organised. Such censorship also meant that people didn’t know exactly what the Nazis were doing and what their plans were. The Nazi’s for example didn’t advertise that they intended to kill millions of Jews. If people did oppose Hitler, they often said nothing. The opposition that did exist, mainly unionists, communists and socialists along with people from the ethnic minorities couldn’t get along with each other. Whilst they all had reasons to distrust or even hate Hitler, they had much the same distrust or hatred for other opposition groups. This meant that Hitler’s henchmen could play these groups off against one another and keep them as tiny, underground organisations with no mass support. Hitler had the constitution behind him: people could hardly say they hated a man that they had voted in! 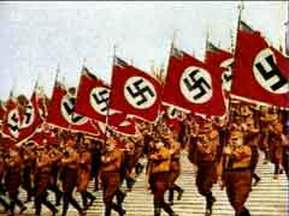 The nazi’s were also very successful and Germany was turned around economically in the period 1933-1939. Jobs and food were the peoples main concern: and they’d accept the strong armed tactics to get them. (Hitler did drop some policies as a result of the peoples apparent dissatisfaction with them). The Rise of the Nazi Party. Themes and Factors. Rise of Hitler revision chart 1-9 GCSE Exam Preparation. Usefulness of Sources: the SA and Nazi methods of control. 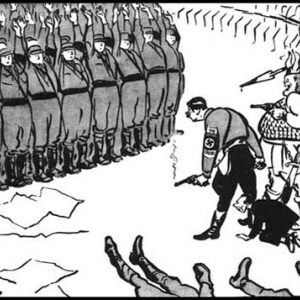 Teaching resource: How did the Nazi’s rise to power? Weimar Constitution 1919-1923: Years of Crisis? Reparations Did the Economic Crisis of 1923 help the Nazi’s? Origins of the Nazi Party 1924-1928: A Golden Era? Resistance and Opposition to the Nazi Regime A wide ranging series of articles on the different opposition and resistance movements in Nazi Germany. Was the Weimar Republic Doomed from the outset? To what extent did Germany recover under Stresemann? The Nazi Party up to 1929 How did Hitler become Chancellor of Germany? Who gained from Nazi rule? Was the Weimar Republic doomed from the start? |To what extent did Weimar recover under Stresemann? How did the Nazi Party develop up to 1929? How did Hitler become Chancellor? How did Hitler become Chancellor? How did the Nazi’s create a Totalitarian State? Henry VI and the problem of his Catatonic state: who should rule in his place? Battle in a Blizzard? How did the weather affect the Battle of Towton?